When the cooler weather starts, I crave all things soft and cozy - including skincare. There's nothing like rich formulas to keep skin silky smooth this time of year. My Skin Trx has an entire line of nourishing body scrubs and body butters to keep your skin baby soft this fall and winter. I have the brown sugar infused Bean Scrub and rich Bean Body Butter. 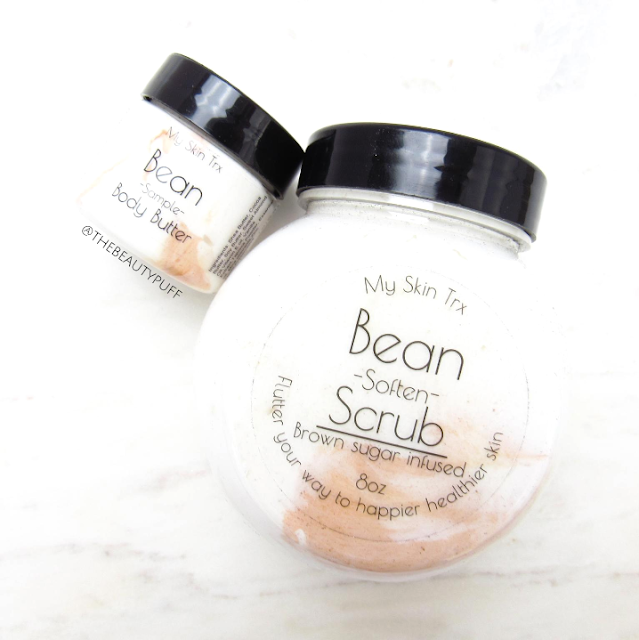 Bean Scrub | This brown sugar infused scrub is the perfect combination of exfoliation and hydration. It's a rich formula that feels almost like a lotion. The exfoliants are just the right concentration to get skin smooth without being too harsh. My skin feels instantly moisturized after using this scrub but there is no oily residue which is ideal, especially for a product used in the shower. While using this product, be sure to minimize the amount of water that gets in the container to prolong its shelf life. This scrub has a very subtle sweet scent. Nothing too over powering, but I love it. Key ingredients include: Brown sugar, Jojoba oil, and Vitamin E oil. Bean Body Butter Sample | If you're not sure what body butter to try first, the sample jars are a great option. These travel-friendly sizes contain more than enough product to see if you like it. I love the texture of this body butter. It's rich and instantly soothes my dry skin. I use it mainly before bed because it is such a nice thick consistency. This body butter has the same light sweet scent as the Bean Scrub so they pair very well together! Key ingredients include Shea Butter, Cocoa Butter, Sweet Almond Oil, and Vitamin E Oil. My Skin Trx products are cruelty-free and free of parabens, phthalates, and formaldehyde. You can shop the entire My Skin Trx line on their website below.